A touring exhibit of Archie Comics memorabilia is at Buttonwoods Museum in Haverhill. THE ARCHIE GANG One of Haverhill’s claims to fame is that cartoonist Bob Montana, who attended high school in the city, based his Archie Comics characters on his classmates. 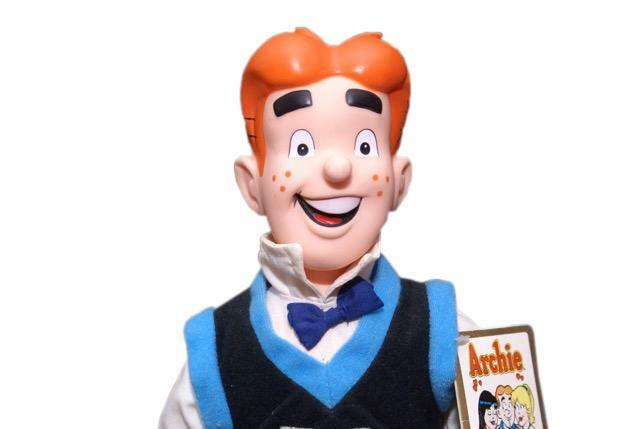 That would include Archie, as well as Betty, Veronica, and Jughead. A nationally touring private Archie Comics memorabilia collection will be on display at the Buttonwoods Museum in Haverhill beginning Thursday, Sept. 3. It’s the collection of Nancy Silberkleit, who took over as co-CEO of Archie Comic Publications in 2008 after the death of her husband, Michael, whose family owned the business since the 1940s. The exhibit includes licensed products related to Archie and his gang, including pins, perfume, a key chain, a puzzle, a baseball cap, a Veronica doll, and other novelty items. It is part of the museum’s look at downtown Haverhill during the Woolworth era of the 1940s to 1960s. Admission is $7 for adults, $5 for seniors, and $3 for children ages 7-17. Buttonwoods Museum kicks off the celebration with a fund-raiser from 6 to 9 p.m. Thursday, Sept. 3. The museum is at 240 Water St. Call 978-374-4626 or visit buttonwoods.org. A showing of the film “Archie’s Betty” by Gerald Peary, a documentary search for the real-life characters behind Archie Comics, and a talk by Archie aficionado Shaun Clancy is at Northern Essex Community College Oct. 1. DOWN HOME IN ROCKPORT Della Mae, a female bluegrass group from Nashville, performs Friday, Sept. 4, at the Shalin Liu Performance Center in Rockport. Their sound recalls vintage string bands while folding in elements of rock, soul, folk, and country. Band members are Celia Woodsmith, vocals, guitar; Kimber Ludiker, fiddle, vocals; Jenni Lyn Gardner, mandolin, vocals; and Courtney Hartman, guitar, vocals. Their second album, “This World Oft Can Be,” came out on Rounder Records in 2013, earning a Grammy nomination for Best Bluegrass Album. The group released a self-titled record in May. The performance begins at 8 p.m., 37 Main St. Tickets are $15 to $28. Call 978-546-7391 or visit rockportmusic.org . COME SING The Polymnia Choral Society is inviting experienced singers of any age, from high school to senior citizens, to join the chorale for the 2015–2016 season. Members come from Melrose, Malden, Stoneham, Wakefield, Danvers, and other towns in the area. Open rehearsals are Sep. 8, 15, and 22. Regular rehearsals are 7 to 9:30 p.m. Tuesdays at Melrose Highlands Congregational Church, 355 Franklin St. The group’s first performance is Sept. 13 at the Melrose Victorian Fair. TEXTURED ARTS Susan Garry, Maureen Baker, and Ann Lee create art for the body and for the rooms we live in. Their creations are on exhibit in “Form and Color/Felt Paint Stitch,” at The Loading Dock Gallery in Lowell from Wednesday, Sept. 2 through Sept. 27. Garry, of Lowell, works with hand-dyed, wet-felted silk and wool. She often uses shibori, the ancient Japanese art of shaped-resist dyeing to create textured surfaces and geometric shapes, especially circles. Her wearable art includes dresses, jackets, scarves, and shawls. Larger pieces function as wall panels, room dividers, and curtains. Baker, of Chelmsford, works in acrylic, oil, and watercolor. She enjoys traditional techniques and subject matter, often glazing a realistic still life or landscape on an abstract ground. Lee, of Lowell, mixes quilt, embroidery, and couture techniques to shape fabric into scarves, jackets, and wall pieces. An opening reception is 4 to 6 p.m. Sept. 12. The Loading Dock Gallery is at 122 Western Ave. Call 978-656-1687 or visit theloadingdockgallery.com. LAST PICTURE SHOW Three underpaid employees of a run-down movie theater in Central Massachusetts are mopping floors and attending to one of the last 35-millimeter film projectors in the state. Their stories play out in the empty aisles of the movie theater and their searches for identity are revealed. “The Flick” by Annie Baker — winner of the 2014 Pulitzer Prize for drama – will be presented at Gloucester Stage through Sept. 12. The cast includes Nael Nacer, Melissa Jesser, Marc Pierre, and James Wechsler. Director is Bridget Kathleen O’Leary. All are making their Gloucester Stage debuts. Performances are 7:30 p.m. Wednesday through Friday; 2 p.m. and 7:30 p.m. Saturdays; and 2 p.m. Sundays. Tickets are $28. The theater is at 267 Main St., Gloucester. Call 978-281-4433 or visit gloucesterstage.com.